I love Martha Stewart's kitchen towels! I bought mine in SM Department Store. It has so many designs that could add a touch of cuteness to your kitchen. I have pink polka, cupcakes, stripes and plaid. I am actually planning to add more. Yes, you can never have too many hand towels, you know. But I noticed one thing, only a few have hoops sewn on it. Among my 5 towels, the polka has it. And since I don't have an oven yet where I could hang it and neither I have installed a hand towel bar in my humble kitchen, it has nowhere to go. It became a messy love affair between me and my towels. So I thought of a great idea! 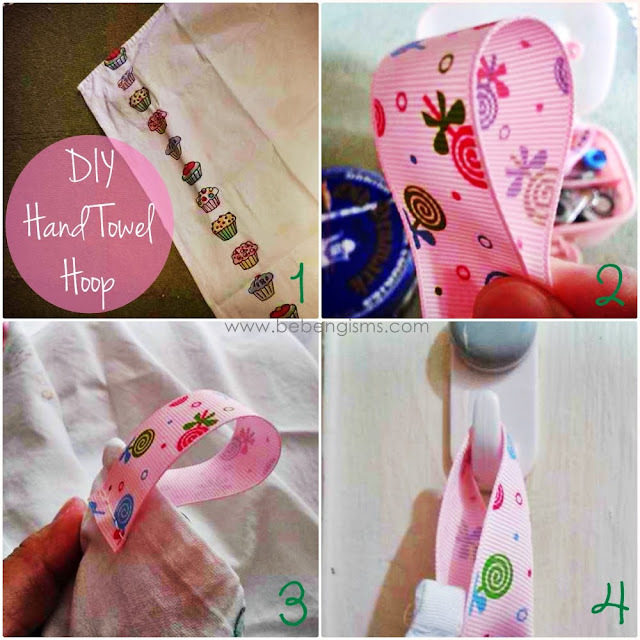 I sewed a DIY hoop for my hoopless hand towel! 1. Get your ribbon scrap and measure it about 3 to 4 inches long. Seal the ends of the ribbon by applying heat on it. I used lighter. This lollipop-designed ribbon is from Xai Ribbons and Craft Store. 2. Prepare your needle and thread. Make a loop on the ribbon and sew it using backstitch on one of the corners of your hand/dish towel. Lock and snip off stray threads. 3. Voila! Hang it on a hook near your kitchen sink or beside the stove. No more dirty hands while cooking. See, it's as easy as counting 1-2-3. Now you're ready to be a kitchen mistress anytime! Why don't you try and share your own DIY'd hoopless hand towel on my Facebook page? Or post it on your Instagram and tag me @royaldomesticity.